It's scary, I know, not knowing what's in medicine, or having no idea what your prescription actually is (What did the doctor just give me!? Why so many pills?). When I had labrynthitis nearly 2 years ago, I was prescribed various drugs from various doctors in my search for a diagnosis. And seeing all those prescriptions all the time worried me, not knowing what was in them exactly. The doctors usually explain what they are giving you and why, but if not you can ask and they'll tell you (and even then, the pharmacists usually tell you what the drugs are for also), but there is still some mystery surrounding the whole thing if you've only been living in Japan a short time, and especially if you can't speak Japanese well enough to really ask (unless you have an English-speaking doctor and grill them about it, but even then the doctor may not be so keen on explaining everything - it all depends on the person). I know not everyone is concerned about this, and I'm not saying you shouldn't trust your doctor (although there are certainly times to be skeptical - unfortunately I've had far too many of these, both in Japan and the US). 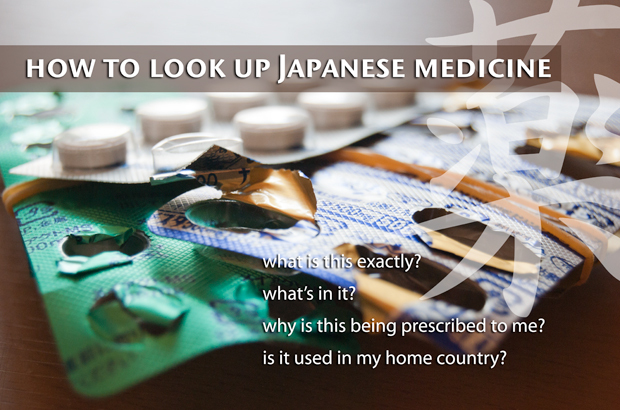 But if you DO want to know what's in the medicine being prescribed to you in Japan just for peace of mind, or if you want to compare it to other countries, you certainly can. How? 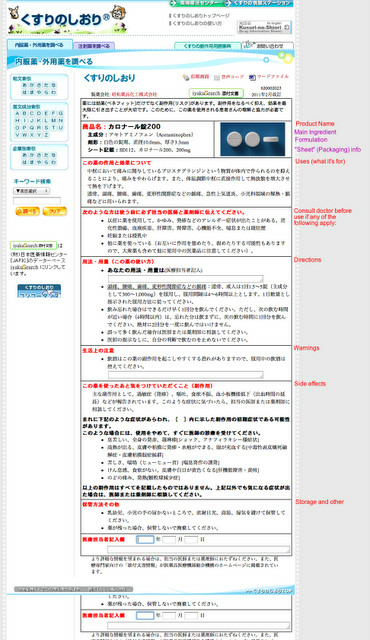 By using a 薬のしおり (くすりのしおり, kusuri no shiori), or "drug information sheet," or in other words, a drug/medicine reference guide. I found several of these during my pre-diagnosis of labrynthitis period, and they were very useful for looking up the various prescriptions I was given, as well as the motion sickness medicine to take with me on the plane back to the US for the Christmas/New Year holidays (I wanted to see what was commonly prescribed or given in Japan and compare with what's common in other countries). A note: the websites are in Japanese, although one I'm mentioning below has an English version, except the English version is not as comprehensive, so there's no guarantee you'll find what you need on that one. However, I've provided a walkthrough of one of the Japanese sites below. That said, it's one way to look up the drug, get the English name (although Google often works for this too) and then research the English name for the drug information in English if you can't or prefer not to read the Japanese information. Google translate or another translation tool also works to help you get the gist of what the page is saying (but I would also recommend looking up the information in English/your native language so you can best understand, and just for general reference). くすりのしおり - I've provided a walkthrough of this site below, as it's in Japanese. Very comprehensive and I found that some of the other guides actually linked results to this one. goo health care - Different layout than the above-mentioned, and doesn't have as many images, but still helpful. 1. Go to the main site, as shown below. 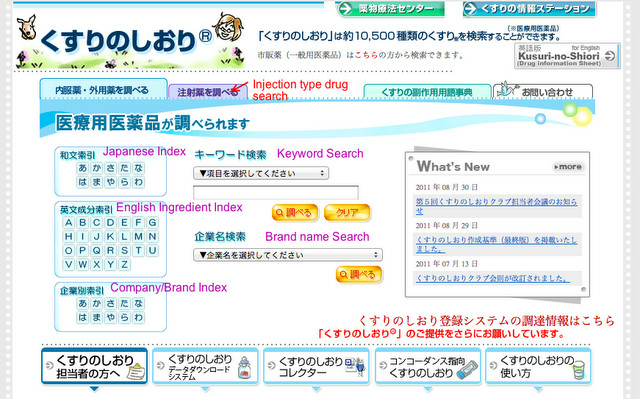 The default section to show up (the light blue tab at the far left right under the site name) is 内服薬 - 外用薬, which means "medicine taken internally" and "medicine used externally." The purple tab to the right of it is for injection type drugs. 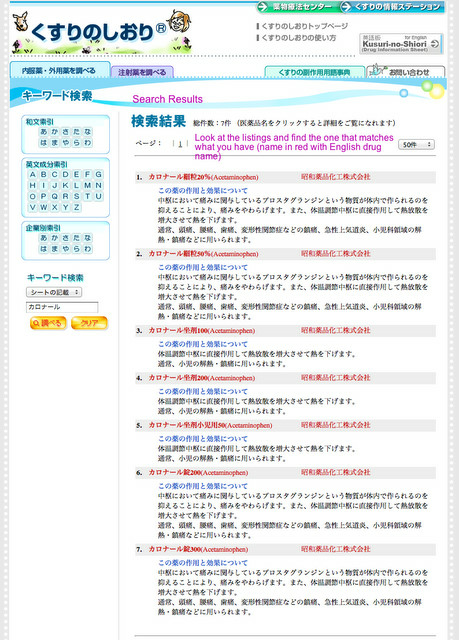 There are multiple ways to search, though the easiest way is to enter your search term in the "Keyword Search" box (キーワード検索) and press the yellow search button (調べる). You can choose one of the following search options from the drop-down menu under keyword search, but it's not required. シートの記述 (シートのきさい) Descriptions found on the wrapper of the medicine, such as name, amount, etc. If you'd like, you can also browse the Japanese index on the left, or the index listed by the English ingredient name, or the Company/Brand name, etc. As an example I'm going to enter in "カロナール," something I was prescribed in the past (it's acetaminophen, in case you were wondering, and yes, it is kind of silly it was prescribed since you can get it at the store also). 2. The results page lists all the possible results for "カロナール." Look through them and choose the one that matches the wrapper, which in this case for me is カロナール200mg (on the list below it says カロナール錠200). 3. The page that comes up lists the relevant drug information, including the name (of course), image, main ingredient with the English name, formulation, wrapper info, uses, warnings, directions, side effects, and storage. I've written the English translations of the headers on the right hand side, but again, the easiest thing to do is to grab the English name and search in English if you can't read Japanese. Google translate will also give you the gist of things, though you always need to be careful with that. Rikaikun or Rikaichan or a similar tool is incredibly helpful for words you don't know if you can read some Japanese. That's it. If you know of any other resources regarding looking up medicine, let us know in the comments!